Photograph from the Curzon Collection: 'Rampur Album' of the Rang Mahal Palace, designed by W.C. Wright in the 1890s, at Rampur, in Uttar Pradesh, taken by an unknown photographer in c.1905. 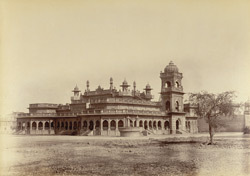 W.C. Wright, the Chief Engineer, remodelled and rebuilt the Fort and Palace complex in the city at the instigation of the Nawab of Rampur, Hamid Ali Khan on his ascension to the throne in 1896. Wright's architecture may be termed 'Indo-Saracenic', as it synthesises elements from Islamic, Hindu and the Gothic revival, which was a style used for many public buildings across India in the late 19th and early 20th centuries. This is one of the photographs which was presented in an album to Lord Curzon, the Viceroy of India, by the Nawab on 8th June 1905, to commemorate his visit to the city. They are not an historical record of Curzon's visit but general views of Rampur.